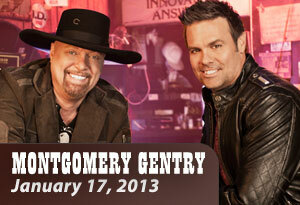 The Montgomery Gentry concert (originally scheduled for May 11) has been rescheduled for Thursday, January 17 at 8:00 p.m. Tickets are $73 and are on sale now. If you’ve never seen Eddie and Troy in one of their smokin’ hot country concerts, here’s your chance. Call our box office at 800-648-4102 or click here to get your tickets now!